The Atomium is one of the Modern World's wonders, was designed by Flemish engineer Andre Waterkeyn. It consists of nine large spheres (one for each atom in the iron molecule) joined by walkway tubes (representing the binding forces between the atoms), and is a conception of what the molecule would look like if it were magnified 165 billion times .The structure has a total height of 103 meters. The spheres have a diameter of 18 meters. This structure serves as the centerpiece of Expo 58 , the first World's Fair since the beginning of the Second World War. Today. 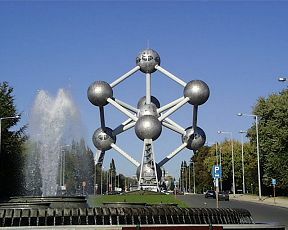 the atomium is the symbol of Belgium.